Hooves of large draft horses beat a steady rhythm on the street. 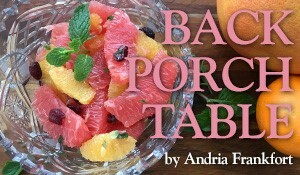 Brandi Dowell is sitting atop a bench in a rented horse-drawn carriage, sipping hot cocoa. Festive lights are strung around the sides. She’s bundled in a blanket, sitting next to her best friend of 25 years, Melanie Rothwell. Seven kids’ laughter surrounds them. The carriage takes the riders past exquisitely decorated homes in River Oaks. The children point out Rudolph, Santa Clauses, dangling Christmas lights, nativity scenes and trees where every last twig is wrapped. 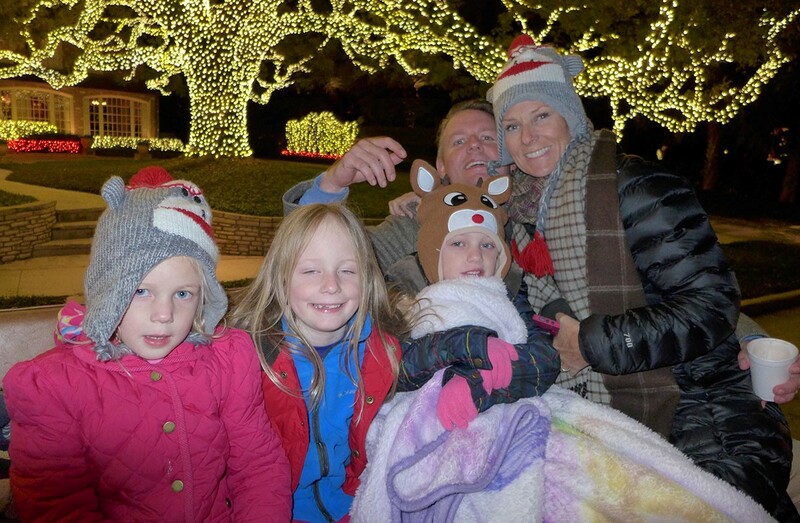 It’s one of Brandi’s favorite Christmas traditions – taking a 2-hour horse-drawn carriage ride through River Oaks to look at lights. The Dowell family has done it every year for almost 10 years. Looking at elaborate Christmas-light displays in River Oaks is a long-time custom. Some holiday nights, drivers find themselves bumper to bumper, with a horse looking in their back window. Brandi and her husband Brian, who both work in commodities, started with their four boys, Fletcher, now 12, Judson, 10, Dash, 8, and Watson, 6. Each year, they invite a family or two to join. The group brings hot chocolate and bundles up (or not) for the ride. Melanie Rothwell and her husband Scott, 10-year-old twins Georgia and Ella, and Madeline, 8, often join them. They start out the night with fajitas at the Dowells’ home. “We meet at our house first for hot chocolate and eggnog or hot cider with rum,” said Brandi. It was a chilly night and since the carriage is not covered, Lauren brought blankets and wrapped up baby Beau. “The other kids weren’t cold. They were hanging off the sides, having the time of their lives,” said Lauren. 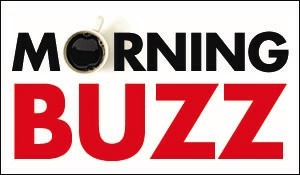 Brandi says they usually book the tour on a weeknight – although she says weekends are more fun, just busier. They’ve braved all sorts of Houston weather for the rides – from freezing temps to 80 degrees and rain. “I always joke with Brian that you can tell by the lights every year what oil prices are doing,” she said. MERRIMENT Melanie and Scott Rothwell, along with three daughters Georgia, Ella and Madeline, join the Dowell family to take a carriage ride to look at Christmas lights. 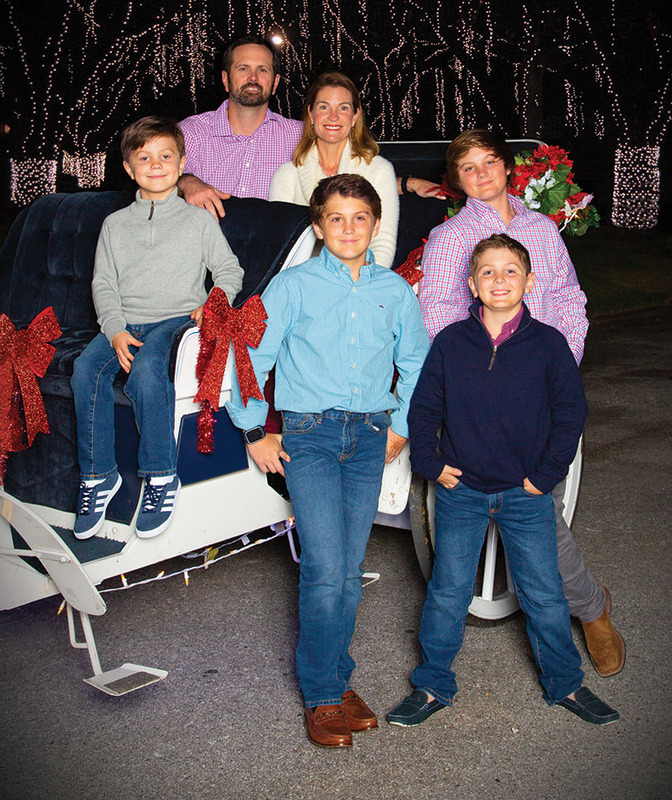 Rick Tatum, owner of Classic Carriage Company, is one of the carriage operators – he has been doing rides in River Oaks and other neighborhoods for about 12 years. He says it’s best to book in advance for a preferred date. “We try to make lifetime memories for families,” he said. He and his wife Barbara offer carriage rides for 6-12 or truck hayrides for up to 24. 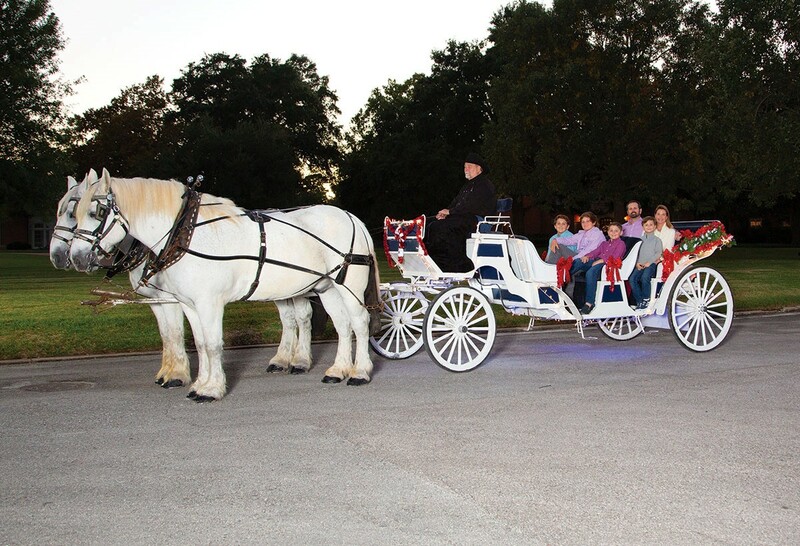 Nancy Yardley planned a first-time carriage ride last December for her kids and grandkids. There were 11 total – including five kids from 18 months up to 7. Nancy’s daughter-in-law, Kaitlin Yardley, recalled what a gift it was for the family. “I think it’s a perfect thing to do with grandparents,” said Kaitlin. The family ate dinner at Nancy’s home before the carriage ride. “Of course, the kids all loved the horses,” said Kaitlin. She suggests bringing music, snacks and maybe a favorite stuffed animal or comfort blanket if you’re bringing a small child. The holidays are a time of the year to celebrate traditions and enjoy time with family. While you could just load up in the car and drive down streets to look at lights, a car – no matter how loudly you turn up the holiday-music station – does not go clip clop.